Reading or Playing by Ear? Shinichi Suzuki’s talent education method focuses on first developing the auditory-motor skills involved in playing a musical instrument and then, significantly later, the visual skills needed to read music. Listening and imitation are able to directly communicate aural memory skills and beautiful tone much better than reading. 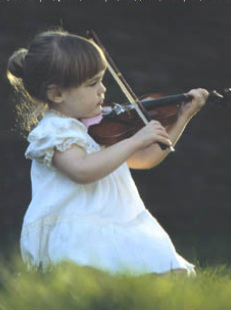 Learning by ear also allows time to establish good skills before reading is introduced, such as good posture, tone and stability of technique. Listening provides a role model. Through listening, learning is absorbed.